How many of us are blessed to live the life we want to live? Now I am not talking about having huge amounts of money, driving a certain kind of car, etc. I am talking about the important things of life. Faith, family, friends, simplicity, love, caring for others. We've chosen to be focused on people over things and the results have been wonderful. We have deep and meaningful relationships, which give us encouragement, and a sense of community. By being deliberate we have a rich home life with lots of laughter, joy, and love. We do have stresses and we do have struggles, but the joy of our home makes it a place we all love to be, in the place where we are loved and accepted. 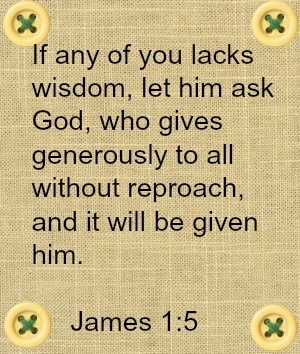 This is our verse for our school year! I think it is a great one. Rachel thought of it. I always go for the one that says "So teach us to number our days, that we may gain a heart of wisdom, " which is Proverbs 90:12. Mondays are going to be busy for us as we get our morning school done and then Sarah's piano teacher arrives with her family, she has her lesson and then we start our home economics group. We made bread yesterday. The French Sweet Bread we all love, and that Rachel makes every month for our church's communion service. 1. Dissolve yeast in water. Heat milk to lukewarm. In a different bowl, combine egg, sugar, cinnamon and salt, if using. There are very few photos of this weekend, because I was busy living it. Friday night we hosted a gathering of church friends who have been watching the video series of Love and Respect. It was a good and if you are not familiar with it check out their website. Saturday our friend Jeremiah and two of his sons came to help Tim with some excavating around our barn to help with the flow of water when it rains. I made omelets and nutella waffles for breakfast and turkey and cheese sliders for lunch. So, so good! Genesis 1:3 And God said, Let there be light, and there was light. John8:12 Again Jesus spoke to them, saying, I am the light of the world. Whoever follows me will not walk in darkness, but will have the light of life. Luke11:36 If then your whole body is full of light, having no part dark, it will be wholly bright, as when a lamp with its rays gives you light. It was cool and crisp last evening. The kind of night usually experienced it the Autumn. And I did something that I've missed. I had a deck date with my man. As you know, I am NOT a fan of heat and humidity. In the summer I tend to hide out in places with Air Conditioning. If I have to do outside work, I do it early in the day or in the evening. Yesterday was lovely. Very pleasant. I went out used the bow saw to take a few branches off of our Red Sunset Maples in the front yard. Just smallish ones that are growing too low. I like not whacking my head when I mow. When the evening rolled around, the kids returned from their ultimate frisbee game at the park, and proceeded to hang out with Lindsay in the living room. My man said, "Its nice outside. We should sit on the deck." I agreed quickly. Out we went and were quickly joined by Emma. Tim and I held hands and we all looked at the stars, and watched for satellites. I used to think it was just a phase and it would slow down again, but it hasn't. I'm speaking of the busyness of my life. I've come to accept that this is part of being available to the Lord, being poured out for His purposes. I couldn't resist showing you this cutie! I told you about our Practical Skills Summer. That is going well. Sarah helped with dinner last night - I gave her the job of seasoning the chicken and getting it into the oven. It was delicious! A few of my friends, with girls around the same ages as Rachel and Sarah, and I are getting our girls together one day a week (we just started this week) to learn homemaking skills. We figured they'd have more fun sewing skirts together, or aprons, learning basic knitting stitches, crochet, stitchery. We are going to do bread baking and some other cooking. It is going to be nice because each of us will take a different week to be in charge of, so no one Mom carries to load. ****Lindsay's surgery went great and she is home and resting. The doctor was so pleased to find that there was not a tear in the meniscus at all! Just needed to replace the ACL and that went splendidly! She's happy to have it done. The staff were all very warm, friendly people and they were all so interested in her job as animal handler! She even had a nurse showing her photos of her own horse! Here is a photo of her not too long before she went in for her surgery. Thanking you all for your prayers! What a blessing you are to me! By the time you read this, most of you anyway, her surgery will be over. We found out this morning that we have to be at the hospital at 6:00 am and her surgery is at 7:30 am. She is eager to get this done and get back to her normal life. She said tonight, "How soon can I run?" Not that she is a runner or anything but she cannot wait to MOVE normally again! "You can have all this world, give me Jesus." Becky's delightful mother in law fell a few weeks ago and broke her knee. She's been sprung from rehab, but is adjusting to being at home and yet not being able to put pressure on her leg at all for about 4 more weeks! Also tomorrow Becky and her husband take their daughter Chelsea and Becky's mom Ruth to the airport. Chelsea is going on an adventure. See, she is going to Australia to do training at a WYAM base and then in 3 months she'll be going to Thailand. Big stuff and oh, so far away from home. This is where the prayer comes in. Pray for Chelsea and her trip and time in Australia. God is going to teach her some things, of this we can be certain! Also pray for Becky. She is happy and sad all at the same time. Pray too for Georgia, Becky's mil. She was supposed to go on the first leg of this journey with Ruth and can't because of the leg. Several years ago, I bought this sweet little plate rack at a yard sale for $2. It was stained a dark brown, and I knew I would paint it white. I began painting it and some else finished it for me. It was not done very well, and had runs of paint on it. So it sat in my basement for two years. Always in the back of my mind I knew I could make this cute and useful somewhere in my home. Last month it was sanded and ready to be made over. I had been reading Miriam's blog for a while and wanted to give her milk paint a try, so I purchased some from my favorite store - Fresh Vintage by Amy in Strasburg. Amy is a sweet friend, and very talented. I bought the Ironstone Color and gave it a go. I like how it turned out, and I decided to use it in my bathroom. I have some items that will be going on these shelves but I am very happy with it. I like to pop in at the Maxx and see what they have in their housewares section. This time I was looking to see if I could find any tablecloths like Manuela showed us in her post here. Doesn't that look great? She and I use the same basic colors in our houses, and I am looking for living room curtains. I only have one large window and thought it might be fun to try this bold pattern there. However, they did not have any at my local store. That didn't stop Lindsay and I from poking around anyway, and look what I found! 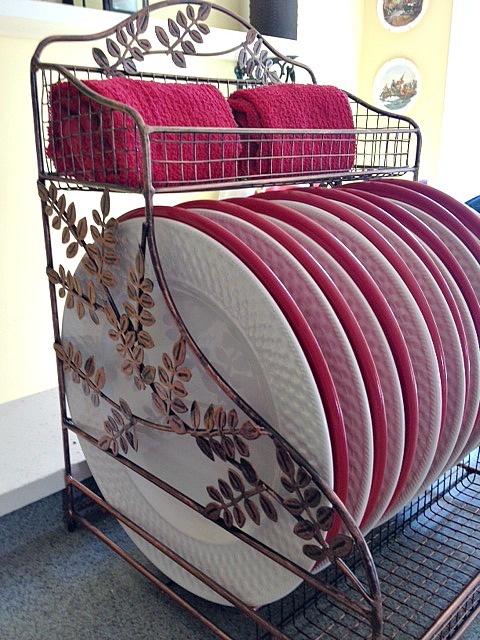 This fabulous wire dish rack! I've wanted something like this for years. I am not sure if I'll stay with the copper finish on it or paint it black, but for now I am happy with it. It has pretty details and holds all of our everyday dishes. I also found these great barkeeper towels in red! These are the best towels for being absorbent. Have you noticed how many cute towels out there these days will not absorb liquid? Kinda crazy. We're having fun again this month at Vee's! I have been looking back over some of my old posts and found some of these lovely items that I use in my home. Would you buy cards with these kinds of items? Yesterday afternoon we celebrated Sarah with a tea party! I had promised her scones, cream, lemon curd and jam, and treats. They could choose where they wanted to eat by which cup they wanted to drink out of. I love that these girls loved the tea party! Sweet girl loves her chamomile tea with raw honey! I made cupcakes and home made buttercream frosting, the mock devonshire cream. Lindsay made the scones, and the lemon curd! Fun view of the table! These girls were all delightful and precious. I love a tea party, don't you? I've been showing off my hydrangeas but I wanted to show you some of my other flowers that are in bloom here at our cottage. I took this photo while I was mowing the other day. I have daisies to the left of the hostas there by the tree, and if you look carefully you can see our small chicken coop and one of the month old black australorps. We have Japanese beetles this year again. They like my roses and my hibiscus, which is not a surprise considering they are in the same family of plants. This variety of Rudbeckia is tall - these are right against the deck and I'm standing on the deck taking this photo. They are also the perfect country flower! So charming and long blooming. They look great cut too! My poor potted plants! So much rain - the sweet potato vines aren't thriving this year. The coneflowers, black eyed susans, hydrangea, and hibiscus are loving all the rain this year! Something that has been snacking on the petals of my black eyed susan. Not nice! Lindsay Really Messed Up Her Knee!